PISG Was Active at World Stamp Show! 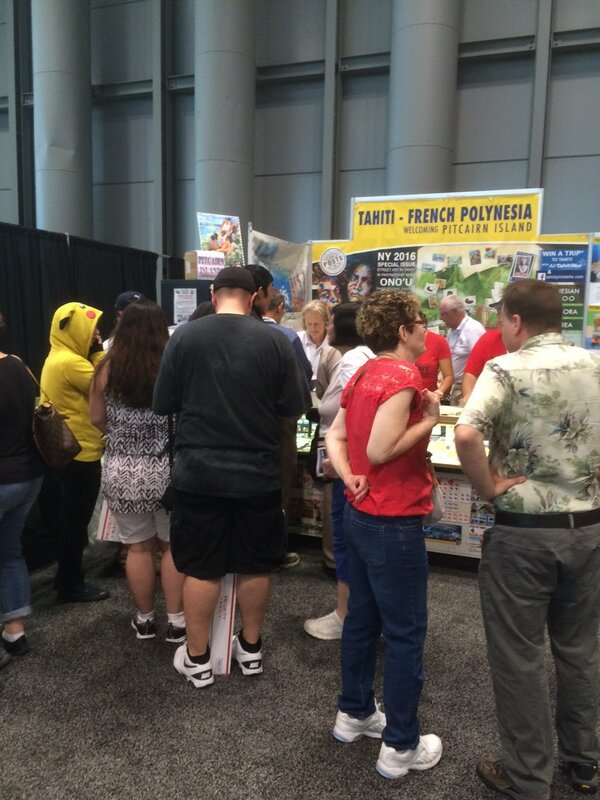 Our society was active in several ways at World Stamp Show – New York 2016 (WSS-NY 2016). This is the mother of all United States stamp shows which is held in this country only once a decade. Our board of directors convened for an informal business meeting. Two society members delivered talks about Pitcairn Island, and a society dinner was held at a local Manhattan restaurant. PISG also shared a joint table with another philatelic society for the duration of the show. 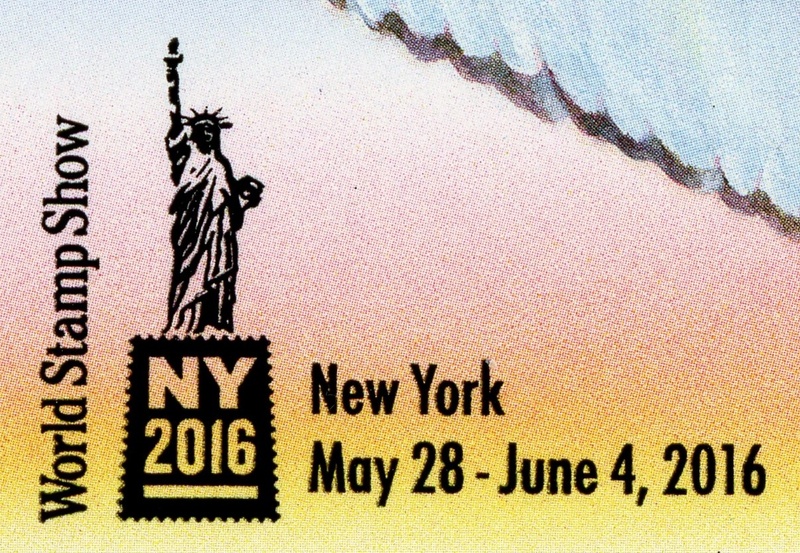 WSS-NY 2016, held at New York City’s Javits Convention Center May 28-June 4, 2016, was the first international stamp show to be staged in the U. S. since the show held in Washington, DC in the spring of 2006 (Washington 2006). 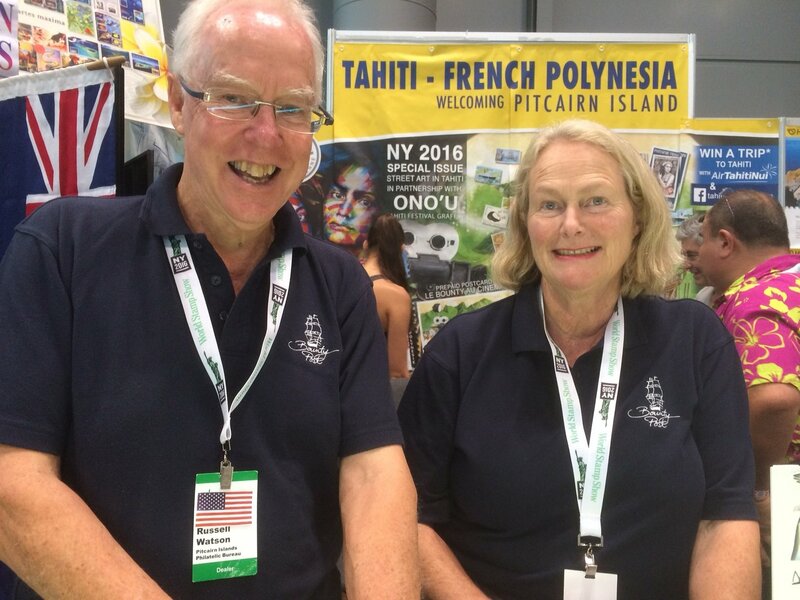 Later that afternoon 22 members and guests attended The Pitcairn Lectures, organized by Past President Mark Butterline and also held at Javits Center. PISG President Dr. Vernon Kisling, Jr. presented a fascinating talk and slide show entitled, “Establishing a British Colonial Post Office: Pitcairn Island 1904-1940.” This was followed by a second PowerPoint presentation given by PISG member Donald A. Maxton, a well-known and prolific author on Bounty Saga topics. Maxton’s interesting talk concerned novelist James Norman Hall’s little-known 1933 voyage to Pitcairn Island. Hall, with co-author Charles Nordhoff, penned the Bounty Trilogy, which several attendees commented was responsible for piquing their initial interest in Pitcairn Island. Following the two lectures a video, You Are There! 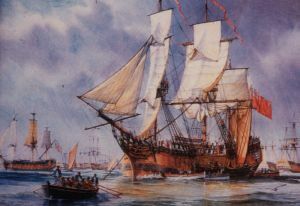 – Mr. Christian Seizes the Bounty (April 28, 1789), was shown. This episode was first broadcast in 1956 on CBS’s You Are There! television program hosted by Walter Cronkite. Interestingly, Fletcher Christian was played by Russell Johnson, who later played The Professor on the Gilligan’s Island television series. Following the model developed a decade ago at Washington 2006 and continued over six subsequent years from 2007 through 2012 at the American Philatelic Society’s annual domestic StampShow, PISG shared a joint table with the St. Helena, Ascension and Tristan da Cunha Philatelic Society (SHATPS) during the eight days of WSS-NY 2016. As at Washington 2006, the table adjacent to ours was operated by the Falkland Islands Philatelic Study Group (FIPSG), another small society. This convenient proximity allowed members of all societies to work side-by-side, greeting visitors and cooperating extensively for the benefit of all three societies. Our joint table provided a place where visitors could be welcomed. Volunteers who staffed the two tables greeted society members such as Past President Peter McCann, George Young and others who passed by to say hello, and prospective non-members alike. The list of members and friends who volunteered to man the table included Mark Bloch, Marianne Butterline, Ted Cookson, Carl Faulkner, Terry Gamble, Stephen Heath, Vernon Kisling, Jr., Ed Madison, Ed Morgan, Wendy Niem and Steve Pendleton. The $250 required to secure PISG’s share of the joint table was donated by Past President Mark Butterline, President Vernon Kisling, Jr., and Immediate Past President Ted Cookson. 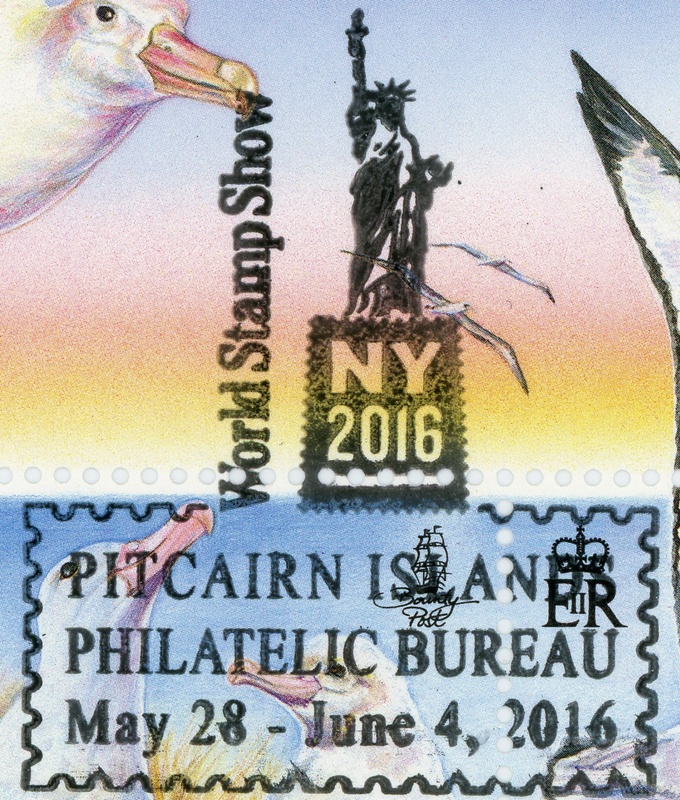 The PIPB overprinted the recently withdrawn Albatross miniature sheet for World Stamp Show – NY 2016. The original sheet was issued on February 27, 2014 and withdrawn on February 27, 2016. Fifteen hundred unsold copies were then screen printed with the show logo, as the unusually shaped sheet could not go through a normal press. In addition to the overprint, some buyers at the show applied the show cancel to the new sheet.